This card comes from Maggie. 🙂 Mexico is one of my top 3 “to visit” destinations and Teotihuacan is the first place I’d go to when I have a chance to go to Mexico. Teotihuacan covers a total surface area of 83 square kilometres and was designated a UNESCO World Heritage Site in 1987. It is the most visited archaeological site in Mexico. The Pyramid of the Sun is the largest building in Teotihuacan and one of the largest in Mesoamerica. Found along the Avenue of the Dead, in between the Pyramid of the Moon and the Ciudadela, and in the shadow of the massive mountain Cerro Gordo, the pyramid is part of a large complex in the heart of the city. 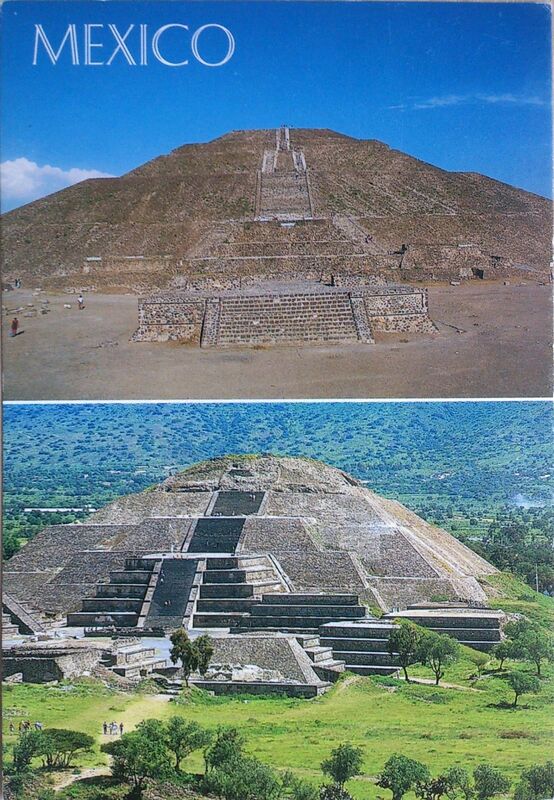 The Pyramid of the Moon is the second largest pyramid in Teotihuacan, Mexico after the Pyramid of the Sun. It is located in the western part of Teotihuacan and mimics the contours of the mountain Cerro Gordo, just north of the site. Some have called it Tenan, which in Nahuatl, means “mother or protective stone.” The Pyramid of the Moon covers a structure older than the Pyramid of the Sun which existed prior to 200 AD.